Copyright St.Cousair All Rights Reserved. 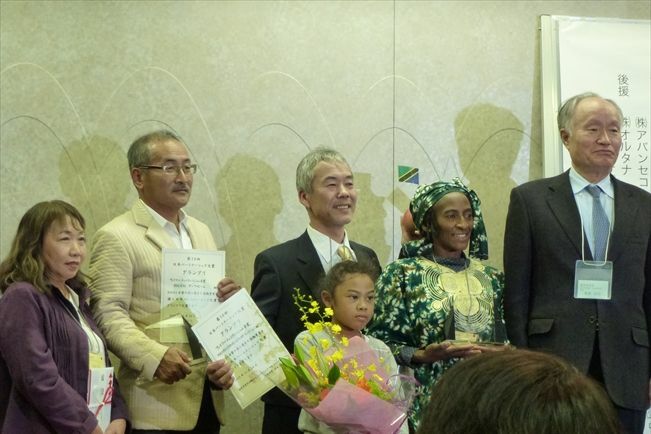 The Partnership Support Center, a non-profit organization (NPO) whose mission is promoting partnerships between NPOs and businesses, announced and awarded the 10th Japan Partnership Grand Prize in Nagoya, Aichi Prefecture, on November 30, 2013. Among the 35 projects from all over the country, Fidea's Charity Jam Project won the Grand Prize. The Charity Jam Project was created by St.Cousair, a food and wine manufacturer in Nagano, to support many activities of Mwangaza Foundation, an NPO established by Ms. Fidea Kobayashi, who came to Nagano after marrying her Japanese husband, to support orphans in her home country, Tanzania. The project raises funds for orphans through the foundation when a customer pays 500 yen (about U.S.$4.90) for a jar of jam, and 100 yen (about U.S.$1) out of this price plus an additional 100 yen from St. Cousair are contributed to the project. From August 2009 when they started selling jams to the end of October 2013, St. Cousair sold a total of 57,380 jars of jam, resulting in a donation of 9,882,100 yen (about U.S.$96,000) to be used for food, education and health care. In the future, the Partnership Support Center will continue striving to discover more examples of collaborative projects that will have greater impacts on communities and society.